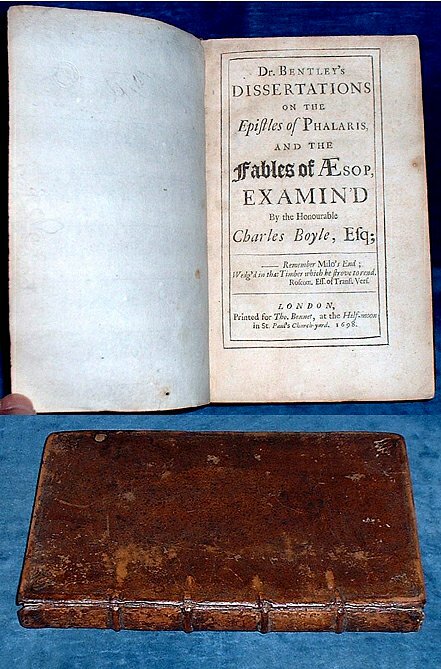 Title: DR BENTLEY'S DISSERTATIONS ON THE EPISTLES OF PHALARIS AND THE FABLES OF AESOP EXAMIN'D By The Honourable Charles Boyle, Esq. Description: London, Tho. Bennet at the Half-Moon 1698 . Octavo contemporary tan roan spine and lower cover (lacks front cover, leather worn). Titlepage +pp preface +290pp with errata below the "Finis". Side notes in Latin & Greek often long enough to require incursion into the text, also some footnotes. Small blind stamped coat of arms on flyleaf with initials RB K.C. Cambridge and faint name F. Creswell. Titlepage & preface bit dusty & fingered, text on better, whiter paper is clean & crisp throughout (WING O469). *A manuscript of the Letters supposedly by Phalaris (of Sicily 570-554 B.C.) was in the care of Dr. Bentley as King's librarian. Boyle complained in his 1695 Oxford edition that Bentley was unhelpful in not giving enough time for the collation he needed. Two years later Bentley replied to this criticism in an essay which said that the Letters were a clumsy forgery by a Greek rhetorician. This book is the patrician Boyle's elaborate reply, produced with the aid of several Oxford scholars. Bentley then won the argument in a splendid scholarly work, but the controversy was justly famous and celebrated in Swift's "Battle of the Books" published in 1704 (see DNB articles on Bentley and Boyle).